GUANGZHOU, CHINA - March 22, 2018 --ZW3D, one of the world's leading suppliers of advanced CAD/CAM solutions for the manufacturing industry, announced its excellent partners in 2017. In 2017, ZW3D continues to execute excellent on global business with stable high growth rate. Now ZW3D reaches another significant milestone and are poised to further accelerate improvement next year. 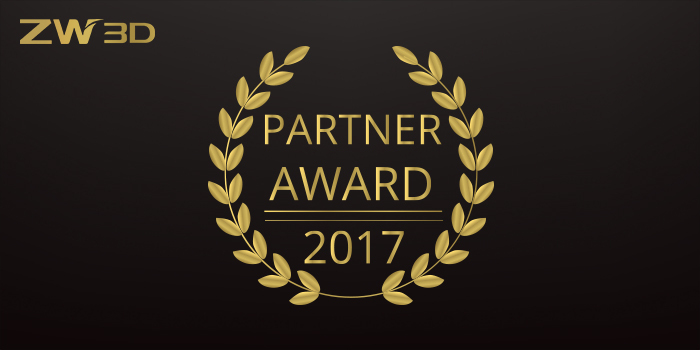 ZW3D Partner of the Year 2017 is to honor the best partner with remarkable achievements in sales, technical and marketing. The judges evaluated entries based on top sales of ZW3D, strong technical capabilities and effective marketing investment. ZW3D Best Contribution of 2017 is to thank the partners for making excellent contributions to ZW3D, especially in marketing and technology. ZW3D Best Sales of 2017 is to reward partners who achieve great growth and continue to increase ZW3D business input. ZW3D Great Cooperation 2017 is for the partners who work closely with ZW3D Team and pay attention to details for continued product improvement. Also, they try new marketing promotion actively. ZW3D TOP 100 is to congratulate partners whose number of customers reach over 100. Their technical strength and service quality are recognized by customers. ZW3D honors 3D Master, with an award certificate for it’ s the No.1 sales of ZW3D license. It has maintained the top 5 sales for 5 years and achieved more than 50% growth in 2017. Besides, it improves ZW3D’s popularity in Poland through periodic exhibitions and seminars every year. Moreover, it keeps thinking about new business modes to increase its market presence - expand distribution network, innovate target market, form industrial cluster, and provide value added service. ZWTech Solutions Pte. Ltd. has achieved dramatic growth in just two years with active marketing exposure. Thanks to ZWTech's great efforts, ZW3D has been becoming more and more well-received in Malaysia and Singapore. Xian Jin Trading Co., Ltd. is our faithful companion. It doubles the sales revenue and rounds out the top five sales in 2017. What’s more, it wins customers’ praise for timely and professional support service. Grup Otomasyon ranks in the top 10 partners in reseller sales worldwide. Its sales revenue has tripled compared with 2016. InfiNIK Co., Ltd. ranks in the top 10 partners too. Its sales increased by over 100%. SoftApply International Corp. achieves double growth in 2017. It continues to focus on ZW3D business. Camcraft Co., Ltd. was active in various marketing activities in 2017, like Email Marketing and Ipros ads. Also, it has done a good job on CADbro branding in Japan. The Sun CAD Training & Designs did well of sales in Gujarat(India). It not only cooperates with ZW3D in marketing activities smoothly, but also feedbacks customers’ need and advice timely. ZW France became more and more professional in marketing promotion which greatly expands the popularity of ZW3D in France. It keeps putting forward improvement suggestions to make a better ZW3D. Nitrosoft Co., Ltd tried new ways of marketing activities and has obtained positive results. It has made great advances through close collaboration. Xian Jin Trading Co., Ltd.